This week has been busy. With warm, dry weather for a change and the last frost behind us, we have been prepping and planting all week, all of us. 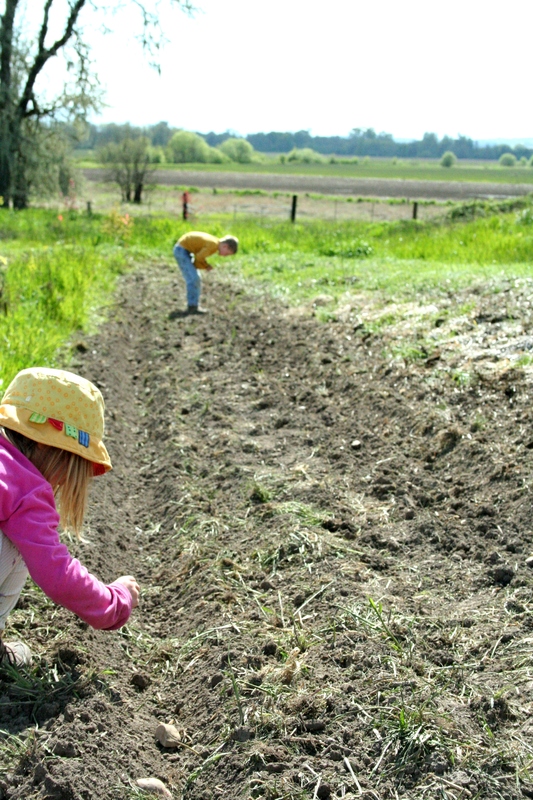 The kids and I, although really just side line workers in the field, do what we can when we can, to help the farmer with all of his work. It is interesting to see how each year, at their different ages, the interest the children have in helping waxes and wanes. There are some ages where helping is the funnest thing happening, others where it is a chore or where interest in it can only be sustained for the shortest time. Tasks in the field usually start out with all of us heading out with a plan to work together, then the farmer and I doing the bulk of the task while the boys each do a bit and then hang out with us for a while and then move on to a game that usually involves complicated story lines and fantastical creations of their imagination–our work all the while made more enjoyable by listening in on these magical worlds. The little girl usually sticks close to me, talking, talking, talking, or gathering things together. Baby is just the right age to nap in his pack on my back! 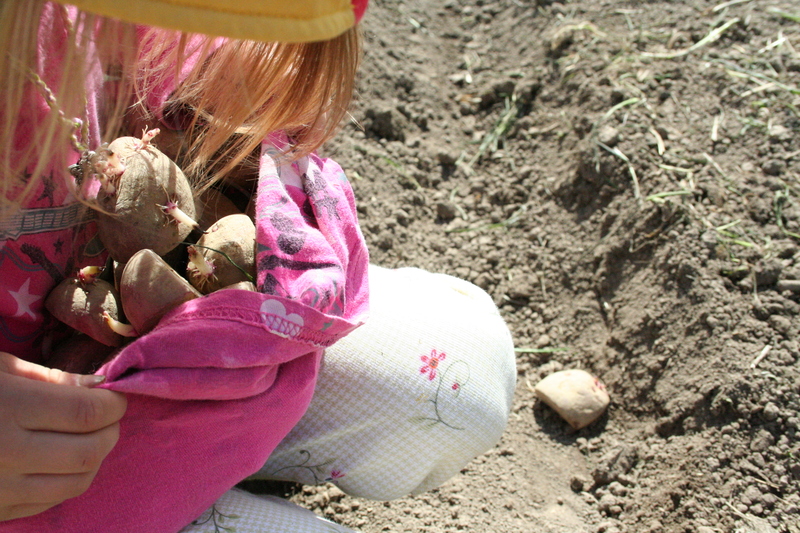 This week, the kids and I planted out the potatoes and the cucumbers. The farmer, so much more. 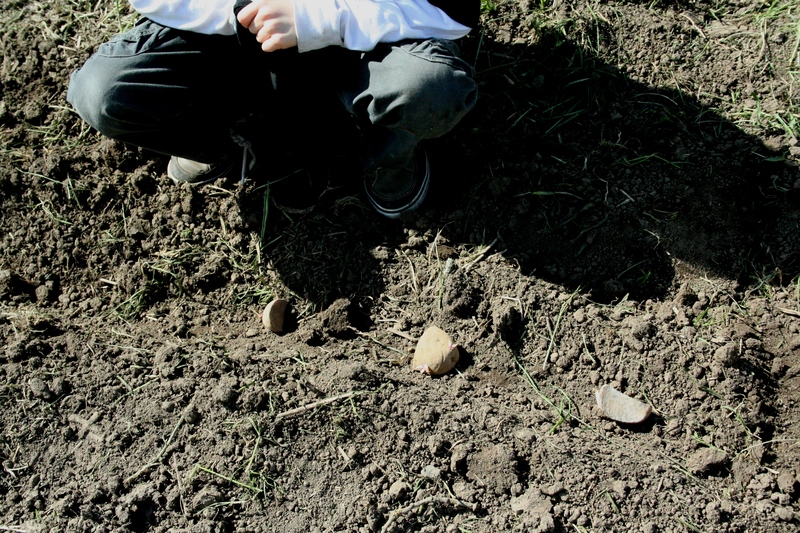 I managed to move a lot of compost, and the boys planted flowers for their cut flower business. The little help we can bring eases the burden at this time of year that the farmer feels, needing to be in about 100 places at one time, especially on harvest days that are too dry and nice not to be planting on. And on those nice days, in the afternoon after we are done with school stuff, there isn’t anything we’d rather be doing anyways.